More and more, researchers are finding that practicing kindness and serving others are good for mental health. Studies show that volunteering leads to greater life satisfaction; performing acts of kindness makes people happier and more socially comfortable; and helping others boosts daily well-being. If your child tends to be anxious, you can't make it magically go away, but you can offer tools to manage their discomfort, and strategies to help them cope. "Doing for others" can be one such strategy. See whether the following ideas could be antidotes for your child's worries. Act small. Performing even small acts of kindness can improve people's moods. In studies, simple helping behaviors were associated with higher levels of daily positive emotion and better overall mental health. Try this: When you're out with your child, pay for the people in line behind you at the coffee shop, say hi to someone in an elevator, hand a flower to a stranger, hold the door open for someone with their hands full, tape coins around a playground for kids to find, or simply smile at each person you meet. Want more? 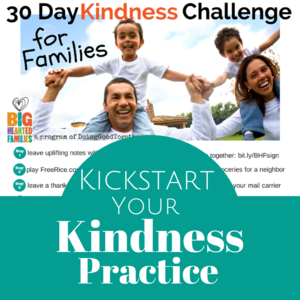 Try one of DGT's kindness challenges. Share a superpower. What are your child's talents, skills, and passions? Sharing them can enhance self esteem, bring joy -- and cheer others. Try this: Is your child an artist? Create cards for hospitalized kids or troops overseas or draw pictures to brighten the day of folks who are isolated. A baker? 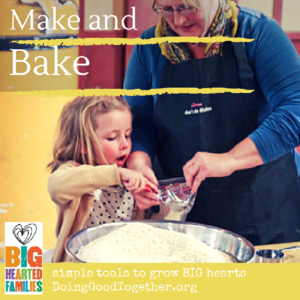 Make treats and share them with friends, neighbors or a local fire station. A musician? Have a recital for appreciative seniors at a local care facility. Help outside. Researchers have shown a strong connection between being outside and a reduction in depression and anxiety. Try this: Rake the neighbor's yard, pick up litter in your park, or volunteer with an environmental organization to plant trees, pull invasive species, or work in a community garden. Meditate on loving kindness. Studies show that loving kindness meditation not only increases compassion but also boosts positive emotions, increases life satisfaction and decreases symptoms of depression. Try this: Share this simple guided meditation with your child. You can slowly increase the amount of time they sit as they get older - and more experienced. Give compliments. Getting genuine compliments can boost our well-being, of course, but researchers are finding that giving genuine compliments also has the power to lift our mood. Try this: In the morning, give your child a compliment, then task them with giving three sincere compliments to people they sees throughout the day. At dinner, have everyone share what kind of reaction they got. Focus on giving. If your child is facing a stressful situation, consider changing their perspective by putting the focus on others. This allows them a healthy distraction from their own anxiety. Try this: Does your son fear dogs? Make fleece chew toys, donate them to a shelter for rescued dogs, and talk about how animal emotions can be similar to human emotions. If you begin to sense worries about starting back to school, take your child to pick out school supplies for a child in need, and talk about how the child will feel to get them. Have a giggle. Everyone in the family having a tough day? The best cure just might be a little silliness. Try this: Gather some colored chalk and go out and write jokes and uplifting messages on the sidewalk. Sip hot chocolate at a nearby coffee shop while creating funny car window poetry to share with random drivers. Being kind and generous can improve your child's mental health, especially when you point out the difference he or she is making for others. Here are some ways to help children see their impact. Tell stories from the past about times you've remembered your child being especially helpful and brave. Point out the reaction to your child's acts of kindness: "When you brought those cookies to Mr. Alvarez next door, he seemed so pleased and excited to get your homemade treats." Then repeat the story to others when your child is within earshot. When you see someone doing something kind, bring it to your child's attention. "Did you hear the woman compliment the clerk's necklace? I bet that made the clerk feel good." Ask questions that help your child understand the recipient's point of view: "How do you think the soldiers overseas will feel when they see the card you made?" Think of other ways you can spread joy, such as tying happy messages on trees, leaving May baskets on neighbors' doorknobs, or planting bee-loving flowers. Read these stories together to spark a conversation about kindness and inner peace. Peace is an Offering by Annette LeBox. This beautiful collection of ideas for being kind to others also makes it clear that being kind can bring peace to your heart. Sidewalk Flowers by JonArno Lawson. In this beautiful, wordless picture book, a little girl collects wildflowers while her distracted father pays her little attention. Each flower becomes a gift, and whether the gift is noticed or ignored, both giver and recipient are transformed by their encounter. Older PostBeyond Our Neighbors: A Curriculum for Expanding Empathy and Compassion to "Others"